I don’t make jokes about natural calamities, thousands of people are affected, lives are changed forever and the mental scars never go away. One can however make observations about people who are miles away, unharmed, unhurt, but give into paranoia based on stupid rumours. My prayers are with all the families affected and hope that the causalities in such circumstances are minimal, I can’t help but write about the view from the other side! The 93′ Latur incident was my first brush with an earthquake, at around 4 in the morning we were awoken by the rumbling of windows and rushed onto the streets to find the entire colony already there. Later in the morning we learnt of the quake and the principal had instructed teachers to educate classes VI & VII about quakes despite not being part of the syllabus and class VII teachers were asked to jump to that chapter & ensure all kids had an idea of what really happened early that morning. Our science teacher explained about the various fault types, seismographs and even taught us to make a seismograph with an ink pen and shaking the benches. In the next class our social studies teacher told us about the various quakes in the past, tectonic plates and how dams & oil drilling also could cause quakes. That was one of the best days in school for I actually learnt something that was useful and not regular drivel you had to remember for an upcoming unit test. The fact that I still remember it today stands testament to how much I liked the session. & high-catches7-stones, beating-ball & high-catches. One called Dipak Tijori* bought into this rumour and began wailing fearing the fate of his younger brother in the primary section. While some tried pacifying him, a few pet-students ran to alert a teacher and the rest just stood laughing at him. Unable to bear the nuisance, I tried reasoning with Dipak Tijori telling him that there was no chance such a thing could have happened and I’d accompany him to the primary section to prove everyone was safe. Dipak Tojori’s squeals were getting shriller and irritating when I had to give him #OneTightSlap hoping to bring him to his senses. Don’t blame me, in all those Hindi movies towards the end, the sasurji always slapped the evil saasuma to stop harassing the poor bahurani. After the dramatic music and multiple face turns, the saasuma always turned a new leaf after crying and accepted her follies. None of that happened in my case and Dipak Tijori began wailing even louder. Much to my dismay my slapping was witnessed by the teachers who simply assumed that Dipak Tijori’s wailing was a result of my goondaism! The rumour-spreaders got away and I had to endure a HOW CAN YOU SLAP lecture, followed by threats to write a complaint in my school diary to my parents and even being taken to the principal’s office. Lucky for me, the lunch bell rang & we all ran back to our classrooms. from ArnabI don’t believe anything unless I hear it from Arnab & he tells me that he is the first to break the news like always. One guy called Gulshan Grover* sitting in the US(working late I assume) was searching the Internet for articles and posting on FB so that all his friends like me in the des could feel safe. After a while he began posting his expert comments on how according the him the quake occurred and its after effects. Things got interesting when he began a so-called tsunami countdown and kept updating of how if a tsunami had happened a certain place should be hit by when, and how since that did not happen I should feel a lot safer. Most of his statuses had close to a 100 likes, so I take it he indeed saved a lot of people from panic attacks. The next time there is a Tsunami warning, I hope mother nature seeks his permission before unleashing her fury for her will subdue her with a flick of his little finger. Gulshan Grover could also be an anti-natural-calamity device where he goes places and prays to the Lord Chennakesava and then slap his thighs to avert all natural disasters. I plan to felicitate him with a shawl & a bouquet of flowers, any donations are welcome. 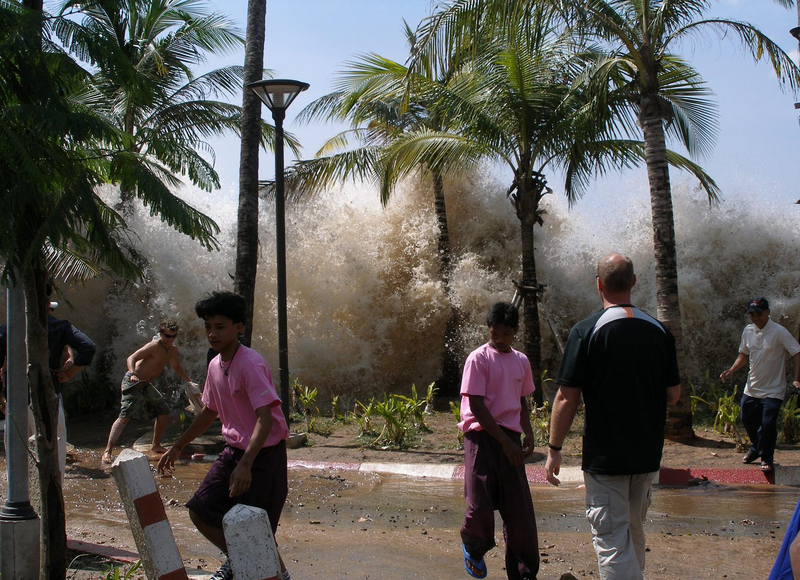 There was a report about how people were thronging Marina beach to see the tsunami. News reporters who were themselves standing on the shore, were commenting on how lame people were to ignore tsunami warnings & come to the beach. Now if you think that those on the beach were ignorant fisherman, then you are so very wrong my friends! Spotted on the beach thanks to news channels, were college students armed with DSLRs waiting to shoot the big waves and document them for the great national personal archives a.k.a facebook cover albums. I got to know from twitter that some were even updating their locations on foursquare(unconfirmed)! This is a major #facepalm the size of Vamana’s hands when he grew so big where he could cover the entire earth with his feet! You may argue that these youths were only there to document the greatest show on earth and would swiftly make an exit once the waves seemed dangerous. I have another theory here, you see there was a movie called Dasavataram(click for detailed rant) where in the final scenes an American terrorist battles a Japanese wushu instructor, and a terrific scientist hides in a boat along with a noisy creature all witnessed by a CBI officer in a helicopter. For the uninformed all the above roles were played by Kamal Haasan, and then there is a tsunami that washes away a bio-weapona tsunami that washes away a bio-weapon giving a chance for 5 other Kamal Haasans to shine and save the world. If you are rolling your eyes in disbelief or have forgotten, let me refresh your memory with this video. So as you can clearly see, it is wrong to blame the Chennai public for they were only thronging marina beach hoping to sight 10 Kamal Haasans. Being a very private person it is very rare to spot Kamal Haasan, so you can only imagine how fortunate the crowd would consider themselves to see him in 10 unrecognisable avatars. I’m also told that a few Rajinikanth fans were also at the beach, only thing that they were there for a slightly different reason. They wanted to see how Kamal haasan could survive a second tsunami and wished for the waves to wash him away. This would not only put an end to the star rivalry but also rewrite lame jokes such as “Rajinikanth threw a stone in the water and the ensuing ripples caused a tsunami” with new ones like “Kamal Haasan in a chapati dough mask has such a big ego that even a tsunami couldn’t quench his thirst“.